According to the religious census of 1851 (SRS 75 p42), there had been a chapel of ease here in the parish of Warbleton since 1838. Nothing is known of this and it cannot have been much, as in 1853 plans for a new church were announced (B 11 p157). The architect was M R Hawkins (ICBS), a prolific designer of modest churches, and the new church was completed the following year. An early C20 photograph (1 p6) shows an aisleless church of similar plan to the present one, with a stone belfry on the east gable of the nave and C14-style tracery, including a five-light west window. 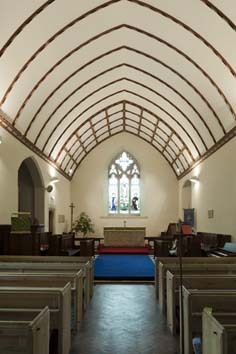 The interior was plain except for a chancel arch with corbels for its inner order (see a further photograph in 1 p12). The lowest tender was for £1441 and an external photograph of the same period confirms that Elleray ((2004) p5) is mistaken in saying that there was a tower. In 1855 a new area was formed, mostly from Herstmonceux (Youngs p503), but it presumably included part of Warbleton as well, and in 1867 this was advanced to a benefice (1 p7). This church was destroyed by fire in 1921 and though most of the walls survived (ibid p12), all that could be re-used was part of the chancel. The new parts of the replacement church were slightly smaller and the architect was W E Tower (GRI). It was opened in 1923 and is partly flint and partly rendered (now very discoloured). 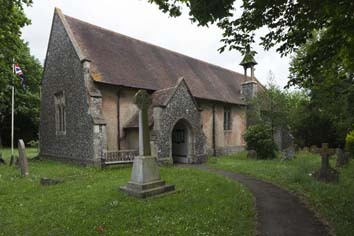 Unlike its predecessor it lacks a chancel arch, though still divided into two distinct parts, but has a porch. The detail is Perp except for the east window, which is noticeably more weathered than the rest of the stonework. From its appearance and from what is known about the retention of some of chancel walling, it could have been kept from the earlier church. Apart from the Perp detail, the only concession to even the later C19 is the position of the open timber belfry, which stands on a slender base of flintwork on the south side, marking the join of nave and chancel. The interior is all the more spacious for the lack of a chancel arch and is plain and light, though this is likely in part at least the result of later redecoration. In most respects it differs little from churches 50 years older, except perhaps for the ceiled roofs; that in the chancel is panelled, with painted main timbers. Font: Concave octagonal bowl with emblems and shields on the sides, recalling C14 and C15 examples in the area. 3. 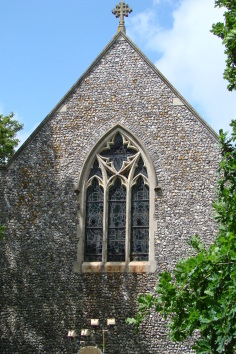 South east window, 1928.